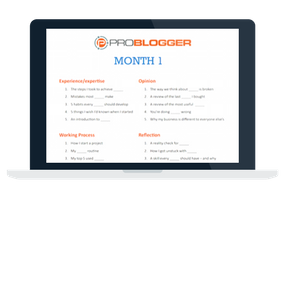 Subscribe to ProBlogger PLUS (our free weekly newsletter) and receive 30 blog post prompts every month for 6 months. One of the most common challenges I see bloggers tackling is creating fresh ideas for their blogs. It's a challenge we all face, whether we use blogs to support an offline business, or whether our blog is our business. Recently, I spoke with a blogger facing this exact challenge and together we spent ten minutes brainstorming topics she could use. It was amazing how many we came up with once we got into the zone. I realised quite a few of them were applicable to all kinds of blogs and so I decided to keep working on it. It wasn't long until I had six months' worth of blog post prompts and decided it might be useful for ProBlogger readers and podcast listeners. It's frustrating when you get stuck but it happens to every blogger. Here's a practical and fun way to get unstuck fast and stop wasting precious writing time. Each month for 6 months, I've organised ideas into these categories: Experience/Expertise, Working Process, Reflection, Opinion, Aspirational/Inspirational, and Learning. Here are a few examples of writing prompts below which can be adapted for different niches/industries and situations. GET ALL SIX MONTHS OF WRITING PROMPTS - FREE! 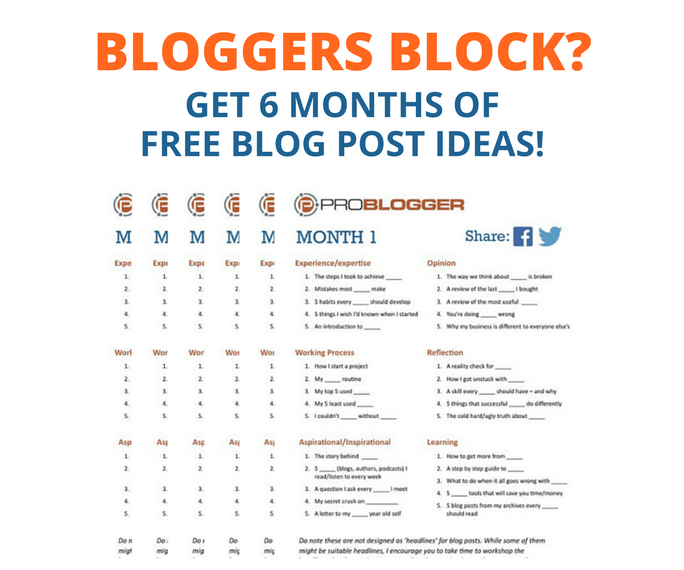 We'll send 30 blog post ideas every month for the next 6 months when you subscribe to our free ProBlogger Plus weekly newsletter.